Posted by jeremyliew in game mechanics, gaming, mmorpg, virtual worlds. Nearly 40% of men and 53% of women who play online games said their virtual friends were equal to or better than their real-life friends, according to a survey of 30,000 gamers conducted by Nick Yee, a recent Ph.D. graduate from Stanford University. Those are pretty fascinating results. I grabbed a copy of the 53 page paper, titled, The Demographics, Motivations, and Derived Experiences of Users of Massively Multi-User Online Graphical Environments, from Nick Yee’s website to see what else he found. Some of the Yee’s findings echo popular wisdom; MMORPG players are overwhelmingly male (86%) and 50% of them are between 19 and 32 years old. Male players tended to be younger (average 25) then female players (average 32), with only 7% of players younger than 22 being female. Yee attributes this to the fact that 27% of female gamers were introduced to the game by their significant others – in fact fully 60% of female gamers played with their significant other. More interesting is the addition research on the emotional intensity that gamers are experiencing. More than a quarter of gamers said the emotional highlight of the past week occurred in game! In addition, around a third said that their most annoying or infuriating experience over the last week occurred in an MMORPG. Interestingly, these ratios declined little for older players versus younger players. Another indicator of how meaningful “in game” relationships and are is that 23% of male players and 32% of female players had told secrets to MMORPG friends that they have NEVER TOLD their real-life friends. This may partly be a function of “anonymity”, but is also a function of the 40-53% of players who felt that their “in game” friendships were as good or better than their real life friendships, as the WSJ notes above. Yee also has some interesting findings on player motivations; why gamers play MMORGPs, that I’ll cover in a later post. Posted by jeremyliew in business models, engagement, facebook, myspace, self espression, social media, social networks, widgets. This week you’ll see us shift our application directory metrics to a focus on user engagement. This will help inform users as they make decisions on which applications to add as well as shift developer focus to engagement rather than total users. More specifics will be available as we roll out these changes this coming week. The focus on engagement is a reflection of how app developers are already behaving today, especially when compared to the widgets being built for MySpace. Both Facebook and Myspace disallow advertising in the widget/apps appearing on profile pages. But Facebook allows application developers to control the canvas page and place ads on those pages, while giving access via the APIs to the social map. As a result, there are already quite a number of companies reputed to be doing over 100m “pageviews” (canvas views) per month, including iLike, Flixster, Rockyou, Slide, Texas Holdem, HotOrNot, and others. [disclaimer – Rockyou and Flixster are Lightspeed portfolio companies]. The companies with a lot of installed facebook apps are all already pursuing engagement, even before Facebook’s change in the application directory. It’s in their business interest to do so. In comparison, Myspace is still primarily about self expression. 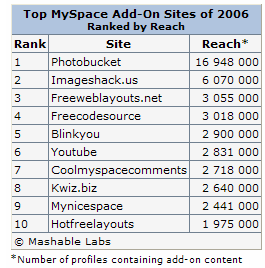 Click through rates from widgets on Myspace are dramatically lower than on Facebook apps. And more importantly, when a user clicks through on a Mypsace widget, they stay for less pageviews than a Facebook app. Because the interaction takes place off site (off Myspace’s site) and because there is no access to the social map, the primary activity is for a new user to create their own widget. There is limited ability for a user to interact with an existing widget because there is such a low level of shared data between the widget and Myspace. 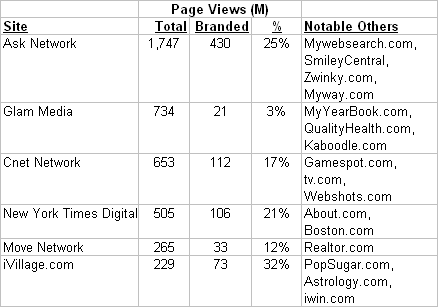 But according to Comscore, only half of the these ten sites have more than 100m pageviews/month, and in at least some cases (e.g. Youtube), the primary traffic driver is not MySpace. Given the striking difference in engagement levels, its not surprising that all the other social networks are considering a platform strategy of their own. Posted by jeremyliew in ad networks, advertising, contextual targeting, video. I posted last week about why I though that Google’s new overlay advertising product would be good for the whole industry; Gootube has both the volume of inventory and the advertiser relationships to make the overlay a standard ad unit. Ms. Naughton also said advertisers would be able to take aim at specific channels and genres, as well as demographic profiles, geography and hour of the day. What is notably missing from this list, especially from Google, is contextual targeting. I wonder if this suggests that contextual targeting is not as important for online video ads as it is for text link ads. Online, Google’s adsense has been the premier form of contextual targeting, and it is primarily about direct response. Television advertising is primarily about branding. Direct Response TV (infomercials) make up a very small fraction of TV advertising and they typically run in latenight and overnight time segments when both ratings and ad prices are low. The question is whether online video advertising will look more like online, or more like TV. For long form video online, it seems less likely that contextual advertising will be a good match. Long form video is more of a “lean back” experience, where the viewer is less likely to click on any ad, even a highly contextual one. That makes it hard for direct response advertising to work. Short form video online may be more promising as viewers may be more willing to click away. People from online video analytics comapnies tell me that less than 50% of online video streams are watched to the end, with the bulk of the drop off occurring in the first 20% of the stream. When you combine this with the fact that both Youtube and VideoEgg are seeing click through rates on their overlay ad unit 5-10x higher than typical online banner ad click through rates (according to the NY Times article), it seems more possible that direct response advertising will work for short form video online. But two factors complicate this situation. The first is that neither Youtube nor VideoEgg are actually using contextual targeting today. The second is that the current advertiser base for VideoEgg appears to skew heavily towards “cool” entertainment ads (gaming, movies, TV and music), or at least so it appears from their sample advertisers. The same is true of the few Youtube ads that I have seen “in the wild”. These early adopters may have more compelling video ads that are not as representative of the mass market – it may be easier to get someone to click away to watch a Superbad trailer than an ad for Tide, even a good one. If indeed it is true that targeting against channels, genres and demographics is sufficient for video advertising, then this is great news for online video startups. Google accuracy at contextual targeting its text ads benefits greatly from the vast volume of ads that it serves, and from its very low cost compute infrastructure. Targeting against channels, genres and demographics requires a lot less volume and a lot less computation, which levels the playing field substantially. I’d be interested to hear what readers think about whether contextual targeting will be the way forward for online video advertising. Posted by jeremyliew in ad networks, advertising, business models, Consumer internet, contextual targeting, video, web 2.0. Google’s announcement yesterday of overlay ads in Youtube has prompted a lot of discussion about the format of the ads, and who invented overlay ads first. – for premium brands and content, the basic pre-roll and companion banners are yielding extremely attractive CPMs and there is little evidence that :15 ads have any negative impact on end-user viewership behavior — in fact, our own metrics show that sites that run without any ads, and then introduce :15 pre-rolls and banners achieve identical usage and performance (e.g. no drop-off in users because of ads) on their content. Nonetheless, we remain very bullish about ‘composite’ video advertising formats that combine overlays and unique and non-intrusive calls to action with deeper interactive marketing experiences. We’ve been pushing this for years and only now are starting to see the publishers and media owners that we work with begin to take an interest in these formats. I believe this is because we’re now entering a phase where content companies are looking at ways to maximize yield and revenue within their content, and they are introducing more mid and long-form content which require, by economic necessity, a different suite of formats to deliver a good user experience. Jeremy’s experience is not surprising. As I have said in the past, new forms of advertising are hard. They take longer to catch on then you expect. Until standards emerge, it can be difficult to cross over from “early adopter” advertisers who are willing to experiment, into the mass market of advertisers. If the media buyer at the agency doesn’t see your sort of advertising as a line item, she can’t allocate you part of the ad spend. That being said, Youtube’s entry into the market is a game changer. With Youtube representing 50% more market share than ALL other online video sites combined (according to Hitwise), and with Google’s existing relationships with advertisers, they have both the volume and the connections to be able to create a standard. And that is great news for VideoEgg, Brightcove, AdBrite, and all the other online video ad networks. Online Google/Youtube can create the standard that the industry needs to be able to really grow into scale. Posted by jeremyliew in business models, game mechanics, gaming, social media, social networks. I’ve posted in the past in praise of Amy Jo Kim’s principles of game design and in particular, the way that social media sites can use keeping score to drive the user behavior that they want. Last week Rajat Paharia, CEO of Bunchball, pointed me to an interesting NY Time’s article that gives further evidence that users will do more for points than they would otherwise. The article summarizes one case from a very interesting paper published in the Journal of Consumer Research in 2005. Points can give people the illusion of advantage. The article describes an experiment where students were asked to do two tasks; one for a reward of a vanilla icecream and the other, slightly harder, for a pistachio icecream. About a quarter of the group did the harder task, which approximately matched the proportion of the group that preferred pistachio to vanilla. A second group was asked to do the same two tasks, but instead were rewarded with points; 60 points for the easier task and 100 points for the harder task. Students were told that people who ended up with 50-99 points would be given a vanilla icecream and people who ended up with 100 points would be given a pistachio icecream (no option to take vanilla instead). As such, the two reward systems were functionally identical. The surprising result is that when points were introduced, over half of the group chose the harder task and got a pistachio icecream. Yet when polled, the same proportion of people preferred pistachio. So when points were introduced, many people chose to do the slightly harder task to get the reward that they liked less, just because they got more points! It seems that points alone gave people some satisfaction. The rest of the paper goes on to extend the findings in various ways that are not covered in the NY Times article. Points can give people the illusion of certainty. One group was given the choice between $1000 now or a 50:50 chance of $6000 or nothing in one months time. 30% of people took the money now. Another group was given the choice of 1000 shares (points) now, or 3000 shares in a month. Shares today were worth $1. Shares in a month had a 50:50 chance of being worth 0 or $2. Again, the two groups faced choices that were functionally equivalent. In this group, 61% chose to take their chances and wait a month. The fact that they were holding shares (points) gave the group a greater feeling of certainty, even though the value of those shares in the future was variable. Perhaps this is why people with frequent flier miles don’t always rush to redeem them even when their airline is facing potential failure. Points can give people the illusion of linearity. A group of people were asked to listen to an increasingly loud and unpleasant noise through headphones for as long as they wanted to. One group was given M&Ms for listening; 10 M&Ms for the first 10 seconds, 9 M&Ms for the next 10 seconds and so on. The other group was given points for listing; 10 points for each 10 seconds. The first 10 points that they earned could be traded for 10 M&Ms, the next 10 points for 9 M&Ms and so on. Again, people rewarded with points listened for longer on average (median ~105 seconds vs median ~75 seconds) than people rewarded with M&Ms directly, even though the rewards were functionally the same. Some people focused more on the linear increase in points than the non linear increase in outcome/rewards, and this kept them motivated for longer. There are clear parallels here to the established practice on increasing the number of points before “leveling up” in games. I’ve only summarized the results here – its worth reading the whole paper and thinking about how you can use points to influence user behavior in your business. Posted by jeremyliew in business models, gaming, social media, start-up, startups, virtual worlds, web 2.0. 1. World of Warcraft, released 2004 – 8.5 million subscribers. 2. Habbo Hotel, released 2000 – 7.5 million active users. 3. RuneScape, released 2001 – 5 million active users. 4. Club Penguin, released 2006 – 4 million active users. 5. Webkinz, released 2005 – 3.8 million active users. 6. Gaia Online, released 2003 – 2 million active users. 7. Guild Wars, released 2005 – 2 million active users. 9. Lineage I/II, released 1998 – 1 million subscribers. 10. Second Life, released 2003 – 500,000 active users. Virtual worlds are primarily about social activities. But this doesn’t distinguish them from MMORPGs. There is plenty of purely social activity going on in the MMORPGs as well. Indeed, for some players, MMORPGs (Bartle‘s “socializers”) are PRIMARILY about social activity. Crawford in his book Chris Crawford on Game Design says that a goal is what distinguishes a game from a toy. Games have a purpose. To borrow the title from Rick Warren’s best selling book, an MMORPG is a purpose driven (virtual) life. In stark contrast, the virtual world Second Life is explicitly not a game, and explicitly does set goals for its users. To push the metaphor a little further, Warren’s Christian “anti-self help” book tells its readers that they were put on earth to fulfill five purposes as defined by God. Similarly, a game player is placed into the game’s virtual world to fulfill purposes that are defined by the game designer. This can take all sorts of forms, from leveling up to achieving certain defined quests. But they are all defined and pre-ordained by the game designer, and I think that may be what distinguishes a virtual world from an MMORPG. Posted by jeremyliew in business models, growth, start-up, startups. The McKinsey Quarterly recently published an interesting article titled The Granularity of Growth ($150 subscription required) that analyzed the drivers of growth at 100 large companies in 17 different industries. A free podcast of the article is available here as well. Within industries, there was very high variability in the growth rates of competitors. For example, ten European telcos saw compound annual growth rates of between 1 and 25% between 1999 and 2005 – a very wide range. Simply put, a company’s choice of markets and M&A is four times more important than outperforming in its markets. This finding comes as something of a surprise, since many management teams focus on gaining share organically through superior execution and often factor that goal into their business plans. Startups can also learn a lesson from this. Riding market growth in a fast growing market is a lot easier than trying to take market share in a slow growth market. Its important to look at markets in a very granular way as you do this analysis. Clay Christensen observes in the Innovator’s Dilemma that disruptive technology shifts can create fast growth submarkets in industries. Often incumbents fail to make the transition across these technology shifts because they continue to focus on their dominant position in their existing markets which may be seeing slowing or declining growth. They miss the portfolio momentum that is such a key driver of growth. Make sure that your startup doesn’t make the same mistake! Posted by jeremyliew in communication, Consumer internet, Internet, social media, social networks, user generated content, web 2.0. When we talk about the “user experience” the main emphasis is often on an individual’s experience with a particular technology. Even with a purported social technology, for example a social networking site, we still tend to create for the individual’s interaction with the site (how does someone find their friend, how do they access this site easily from a mobile device). However, designing for sociability means thinking about how people experience each other through the technological medium, not just thinking about how they experience the technology. The emphasis is on the human-to-human relationship, not the human-to-technology relationship. This is a crucial difference in design focus. It means designing for an experience between people. Read the whole thing , but one example that really struck home to me was about “focusing on the (meta) message” rather than “focusing on the mechanics of communication”. If you understand the meta message being sent as part of communications, you can really improve your users experience. Motorola gives two “meta messages” that are common “I know you” and “I care about you”. Facebook‘s birthday notifications on their homepage is a great example of a product feature that supports both of these meta messages. It helps users know when to write on a friend’s wall (or Superwall!) to send both these messages, both to the recipient, and as a performance for other friends of the recipient. For those interested in more about social design, I also find Josh Porter’s blog Bokardo quite helpful. Posted by jeremyliew in ad networks, advertising, business models, Consumer internet, Internet, web 2.0. Glam has received a lot of attention recently, with many noting that its Comscore traffic is a rollup of multiple sites, some Glam branded, but most part of an affiliate network. The non-namesake traffic was mostly driven through acquisition, although in some cases (e.g. Zwinky) the growth was organic. In many other examples though, acquisitions have been absorbed into the URL structure of the acquiring company. Yahoo for example acquired Launch (now music.yahoo.com), Hotjobs (now hotjobs.yahoo.com) Geocites (now geocities.yahoo.com), among others, all of which now roll up under the Yahoo.com URL. As an online media buyer, perhaps I have a different opinion then most of the outsiders commenting on the sidelines. I use comScore and NetRatings on a daily basis for planning media spends targeting large audiences online… The only way to measure the audience that any large media property reaches is through a panel based media measurement tool like comScore… It does not matter if they own a site or have a partnership with them. This stuff is no big secret. Posted by jeremyliew in business models, Consumer internet, Internet, Search, start-up, startups. Before I joined Lightspeed I was General Manager of Netscape, where I was responsible for the portal and the browser. Search drove about half of Netscape’s revenues and so I spent a fair amount of time trying to understand how to best monetize search traffic. 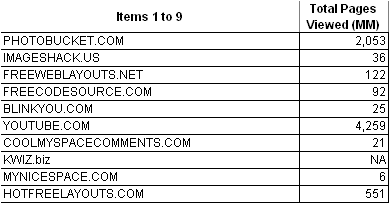 One thing that initially surprised was that the top two search terms on Netscape.com were “Google” and “Yahoo“. It is relatively difficult to monetize navigational and informational searches. Try searches for “amazon” or “specific gravity of lead” and you won’t see any sponsored links. All the monetization comes from the transactional searches. Look at the huge number of sponsored links for searches on “ipod“, “rowing machines” or “disneyland hotels” in comparison. So a new search company’s ability to monetizing search depends largely on what percentage of its search volume is transactional. For some of the new vertical search sites, this percentage can vary dramatically. Take people search for example. A search on “jeremy liew” in Google yields no sponsored links (although before Ebay cut back its spending on Google there used to be an ad for “Great deals on jeremy liew at Ebay”!). In general, people search is informational. The proportion of transactional searches will likely be lower than general search. This is something that companies like Wink and Spock will need to take into account as they develop their business models. Conversely, sites focused on shopping search will have a very high proportion of transactional queries. The first generation of comparison shopping engines such as Shopping.com, Shopzilla built valuable businesses on much lower traffic than the big general search engines because almost every query is monetizable. This bodes well for the next generation of shopping search engines including companies such as Shopwiki, The Find (a Lightspeed portfolio company), and Krillion. Similar analyses can be conducted on other vertical search engines in areas such as local, travel, video and health – some of these will have a much higher proportion of transactional searches than others. Semantic search startups propose to do a better job on informational search than the current search engines. If they see a greater proportion of informational searches because of this, then they may in fact monetize at a lower rate than today’s search engines. Search is a tough business because of the need to change customer habits and pull search share away from today’s big branded search engines. If a new search engine does not monetize well because of its mix of queries, it has even more work to do.